You asked Tina a good selection of questions and she's come up with some interesting and insightful answers for you. Enjoy! Watch for another Q&A down the road, and of course tomorrow being Thursday (Jeudi, Na quinta-feira, Giovedi, Am Donnerstag, El jueves, Donderdag), I'll have more news and information for you. In English! But in the meantime: Click through for the inside scoop on what a Heartland Producer does! Q: Hi, Tina! My question is on set has there ever been something chaotic that happened? Or are the actors and horses always well organized and calm? A: Alex, we really try to prepare for all the horse action and actor action that we have within a script. But due to weather and other circumstances sometimes the horses are not as able to perform as we would like. We had Kerry James prepare for the laydown horse in episode 201, but on the day it was really cold and wet and the horse was a challenge. Our wranglers and actors are really amazing and after a few tries the horse laid down seamlessly for Kerry James (Caleb) and we got a great scene. I'm so proud of all of them. Q: Who do you consult for natural horsemanship information? I have learned a great deal about horsemanship from watching Heartland. Thanks for making such a quality show and reopening my heart to what is truly my purpose in this life. I plan to open my own Heartland-type Ranch in the near future. A: Hi Brenda. I Hope you totally open up a Heartland-type ranch. The writers do a lot of research into the horsemanship of every script that they write. We are very lucky to have experienced wranglers John Scott, Ray Breckinbridge, Tim McLean and Tom Eirikson be a part of our team. We have years and years of experience with all the cowboys we have working with us on the series. Q: Hey Tina! Let me say that Heartland is the best(By far!) show ever aired. 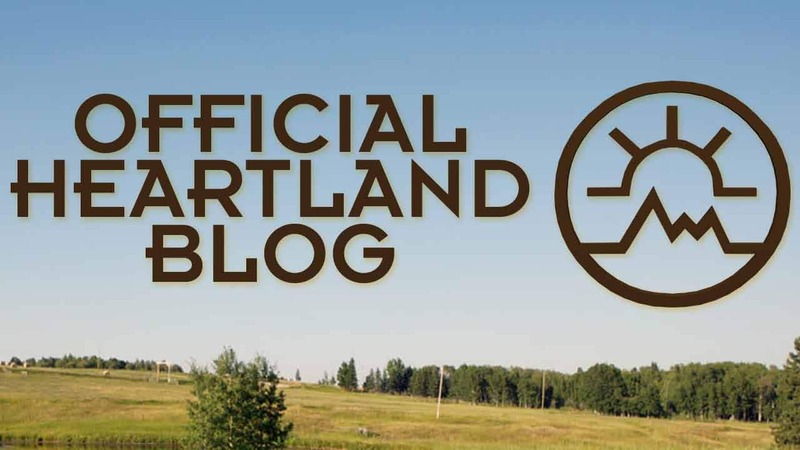 My question for you is, what is your favourite place you've ever picked for Heartland to be filmed? I love the scenery and I believe all the sets and places are magnificent! Hope you can answer and I am dying for season 4!!! A: Jann I am so fond of the locations that we have on Heartland. We searched for a long time for the ideal place for the Heartland ranch. Our Location Manager, Brian Dunne and our Production Designer Rick Roberts found this great place. We knew the moment we drove into the location that this was the place: but it didn't have the Heartland house. So we decided to build it. Rick Roberts and his team did an amazing job with the design and the construction of the place. I also really love the Dude Ranch; again when we walked in; lots of walking with galoshes on, we knew it was the place and we had a real challenge constructing the "decrepit" shacks and then turning the shacks into the cabins that you see now. I also really like the location of Jack's cabin. It's so amazing to me how beautiful Alberta is and we have this really terrific huge province to pick places that give you guys such breathtaking scenery. Alberta is also a very important character in the show. Q: Hello Tina! Heartland is the greatest show! I always watch it! My question is, if you were to be a character on Heartland, who would you be and why? A: Wow! What an interesting question. I think I am a little bit of all of them. Strong minded like Amy, try to pave my own way and be true to myself like Ty, determined and I think funny like Lou, and a rock like Jack. A: Breslau, its hard to pick. But if I had to; I would say 201, when we first meet Caleb and Ty shows up at the end and the wild mustang. I knew you guys would freak out when you saw Amy with a new guy, but we also want to take you guys on a roller coaster ride with the show. There should be surprise, laughter and butterflies in your stomachs when we are on this ride together. And Season 4 is really going to provide that! Q: Hey Tina, May I say you have been doing a GREAT job :)One of my questions is have you Produced any other shows/movies besides Heartland ?! A: Calli, thank you for your really kind words. Its a pleasure to work on Heartland. I have produced shorts and other television series and mini series. Some I am proud of and some that were challenging and to me Heartland encompasses all of it. I produced "Jeff Ltd.", "The Curse of King Tut's Tomb" in India and one of my favourites, "The 11th Hour." The rest you will have to google! Q: Hi Tina, i was just wondering how you got into this career! im going into something similar for school next year and this would be like my dream job! what did you do before this? any good advice! thanks so much for taking the time to read this :) Great job on heartland its become a family tradition to watch every sunday night now! A: Lindsey the best advice I can give you is that the film and television world encompasses all forms of art. Whether it be music, fashion, architecture, literature, sculpture, painting, furniture design, etc. You have to become a student; first and foremost. I never stop learning. I went to film school; which was great. But I am one of those people that needed to get hands on experience. I started working in this business at a very young age; working as a production assistant and worked my way up through the ranks. I have been very fortunate that through my career, people have seen something and set me off on a challenge. Always learn, always grow! You have to work harder and be more prepared than the people around you. Its an awesome and creative industry; but always have FUN! Good luck with school!!! Q: Hi Tina! Heartland is just simply amazing! My question is, what is the area in production that uses the most of the budget? Just curious. Thanks for answering questions for us! A: There isn't really one area. We look at each script as one big pie that gets sliced up. The thing I try to do always is to see what areas give us the wow factor that works with the script. We have had rodeos, horse races, other horse action, and stunts. I work very closely with the writers to see where we can afford to spend money and where we can't. Its a very interesting process where we determine the arc of the story and actually the arc of the budget. Q: Hi Tina, congrats on the success of Heartland! My question for you: As the producer of Heartland, what has been the funniest moment that you have experienced/encountered while working for the show? Thanks for contributing to such an amazing show! A: I am very fortunate to have an amazing group of filmmakers around me. The cast and the crew; we laugh every day. Whether we are in the middle of a scene and the horse is flatulent, an actor can't remember their line and dances instead or someone pulls a practical joke. They are all such characters. Q: Hello Tina. Thank you for doing such a wonderful job on Heartland, it is an awesome show - over all, the best ever! Okay, my question is: "What do you like best about your job?" Thanks so much, thank you if you answer, I really appreciate it because I can learn more about my all-time favourite show! A: I would have to say the variety. Each day is different from the rest. Whether its the scenes we are shooting on set; working with the writers; editors; and the other department heads on the show. I would say that each day is super full but never dull. I absolutely hate being bored. Q: Hey Tina! thanks for the fantastic job you've done at heartland. truly, the show would not be the same without you. anyway, i was just wondering, what is the hardest part of your job? i know its pretty simple and boring question to ask but i'm really curious to know. after all, you make so many important decisions about the show. thanks again for taking the time to answer a humble heartland fan's questions. A: Hi Zoey. I think the hardest thing is the hours. I work 14-16 hours a day. I usually rise very early in the morning and stay up late into the night. Its a good thing that I have a crazy amount of stamina! Q: Hey Tina! I love Heartland you are so great at what you do. My question is that you for the job of producer has to deal with the budget. And for every project there obviously is their limits to what they can and can't do. Have there been things you have had to tell the cast and crew the show can't do because of a budget? Is it hard to keep a show as popular as Heartland under a budget? Thanks! A: Nicole it absolutely is a challenge every year to keep Heartland on a budget. Its hard to say no to the cast and crew; but thats part of my job. I have to make these tough decisions; however I always feel that if you explain why we can't do something, my cast and crew understand. I always want to be fair with my team. Q: Hey there Tina! Very glad you produced the show! :) Here is my question : What do you love most about being a producer? A: Shanna, there are a few things. I love the interaction and sharing of ideas with all the people I work with. I also really love the whole process. It starts from an idea to a script to casting and the production details. We shoot, we edit and finish the rest of the post production. It's really exciting for me to see the whole episode once it's done. Q: hey umm I was wondering if you ride personally? Do you own your own horse?? if do what kind? A: Our Stunt Coordinator Tom Eirikson has been trying to teach me to ride. I have only had time to go to his ranch a few times. It is my hope that before I am done this show I will be able to ride well. I am thinking about taking Amber up on her offer to teach me. Wish me luck, because it's really hard! I have a lot of respect for people that make it look easy. A: I would have to say my favourite couple is Amy and Ty. I love the way they interact with each other. They laugh, they wrestle, they argue; but they both genuinely truly love each other and seldom try to smother each other or insist on their way. And even when they do they always find a happy medium that works for both of them. Q: Hey Tina!!! You have done an outstanding job with Heartland!!!!!!!!! I cannot possibly wait for season four!!!!!! Anyways, here is my question: how do you pick new locations for different Heartland scenes? I wonder if you guys will ever come to Toronto to do some filming, I really hope so!! Thank you for taking time to answer our questions!!! A: Hi Eve. Firstly we look at many different locations for a particular scene in the script. The Director, Production Designer, 1st Assistant Director and Location Manager go on a scout and have a look at what might work. We always consider the arc of the sun; the way we are going to light the show, the beauty and actually the access to the place. We have many large trucks and trailers that are part of the show that travel to each location. Together we decide which one is most suitable. Q: Hello Tina, Greetings from Britain :) Congrats on producing such an awesome show. It definitely restores my faith in TV! Anyway, my question is, what is the most gruelling thing about working on the show and what is the most rewarding thing in your opinion? Thanks!! A: The most gruelling thing is the hours and the weather. Its really hard to stand on set while it rains, snows, sleets and also when the really hot sun is out. The most rewarding thing is when I finally see the whole show put together and I am always amazed at what we have managed to produce. I especially love having advance screenings for the cast and crew. I like standing in the back and seeing what their reactions are. It makes all the hard work worthwhile. Q: First off I think you do an amazing job keeping heartland running!! Without you heartland would fall apart(which no one wants!!!!) My question for you is: How do you manage to get everything done,remember everything and on top of THAT stay sane!? I know I would go insane and probly forget a whole bunch of stuff :P I certainly would not make a good producer! But you most definitly do :) Keep up the amazing work!! A: Thank you Kristin for all the nice things you have said. I have a great assistant by the name of Scott Lepp who keeps me very organized. I think the thing that keeps me sane is that I am a little nuts. I love laughing with the cast and crew; playing practical jokes and generally having fun with all the people I work with. Q: A big hello from the UK :) I'm currently studying media at University and would love to get into the television aspect of the industry. We have studied television production and I found it really interesting, so do you have any tips on how to be successful in the industry?¨Thanks for producing one of my favourite shows! A: Jodie I think the key to success in this industry - or any industry - is to work really hard; learn every day; read all kinds of books and magazines; be organized and be fair to the people that support you. And while you are doing this, fun must be had!!! Q: Hello Tina! I love Heartland so much and you do a great job with it! My question is, I don't know if you would get the time, but if you weren't ever on set, what would we find you doing? Thanks! A: Kitty if I am not on set, I might be in the edit room, approving costumes, looking over schedules, figuring out logistics with the team, in accounting, with the writers, casting, having a tone meeting with the director for their episode or a number of other things. Its a very detail oriented job that I do. Q: Hi Tina! Here's hoping my question squeaks in under the due date! Though it doesn't have anything to do with your budget, the difficulties of being a producer, or anything of that sort, I'm sure whatever your answer is to The Question does at times help to spur your energy and creativity. So, once again, here is the famous question of.... What's your favorite comfort food? Thanks for taking the time to answer so many fan questions (whether mine is one or not), and congrats on the huge success which is Heartland. Keep up the awesome amazing work! A: Twe, so glad you squeaked in your question! My favourite comfort food is a cheese burger with everything on it and a chocolate, banana smoothie. I might even have it for breakfast!!! I also really love PIE! Note from Tina: These next two questions are really good ones to ask of a producer, but not me, because I came on board Heartland only after the pilot (Episode 101) had been filmed, so both Shaun and Amber had been cast in their respective roles as Jack and Amy. I am going to let Executive Producer Michael Weinberg - who was responsible for acquiring the rights to the series of books by Lauren Brooke - answer these questions, because he was instrumental in the casting of the leads, and he can best answer them. I will add that in both cases he hit it out of the park, as Amber and Shaun are great actors and fabulous people, and I couldn't see the show being what it is today without their involvement! Q: Hi Tina. We love Grampa Jack(Shaun Johnston) so..... our question to you is were you part of the casting of Shaun becasue we have read and seen that he is not as old as he plays on Heartalnd. Why did you pick someone younger? We are glad you did becasue he is Grampa Jack. Thanks. A: Executive Producer Michael Weinberg answers - The entire process of television production has been very exciting and it is great to see how Heartland has turned out. We had a great selection of very talented actors trying to land roles in the pilot. I was at the live audition when Shaun Johnston was actually trying out for the role of Tim. Shaun had a scruffy beard and looked very much like a cowboy for, at that time, he had come directly to the audition from another show where he was playing a cowboy. I came up with the idea to age Shaun and have him try some of Jack's lines in his audition. Shaun was game enough to try and we all realized he would be perfect for the role once we heard him read. A: Executive Producer Michael Weinberg answers - Again, there were many talented girls from across the country who auditioned for the role of Amy. A lot of them were good but we couldn't reach a consensus on which was the best. Then three days before we started to shoot the pilot a CBC executive involved in casting remembered Amber Marshall and had her send in a self taped audition. The minute the tape started we all knew she could be the one. By the end of the tape, it was unanimous. 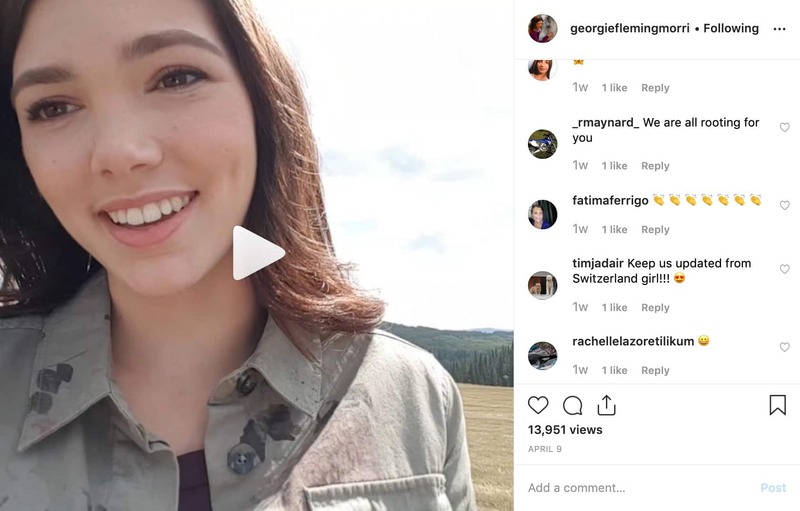 She was flown out to Calgary the next day and filming started the day after that. By the way, her first words on the audition tape were, "My agent told me to tell you I have my own horse."